We are near the tiny village of El Pego near the southern border of Toro, Castilla y León. 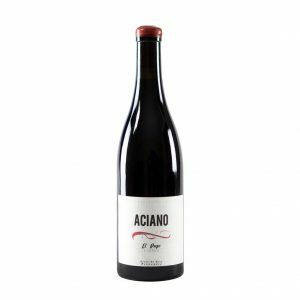 Aciano is a 3 hectare vineyard that Alvar de Dios Hernández inherited from his grandfather. The altitude is more than 700 meters, the soils here are sandy, quite special for this area. And for this reason the 100 years old ungrafted vines have survived the phylloxera plague. Aciano was his grandfather’s nickname, so the wine is baptized in his honour. The vineyard practise is organic and biodynamic.For this wine the grapes were hand harvested. 60% whole clusters, 3-4 day pre-fermentation maceration, natural yeast fermentation in big vat, daily soft pigeage, 20 day maceration are other keywords. The ageing was then done for 12-14 months in big, old French barrels, mostly neutral. Alvar was born in El Pego, but he came in contact with Fernando García and Dani Landi of Sierra de Gredos, and was at a time cellar master for Fernando at Bodegas Marañones. (See various write-ups about the two around this blog; here is one.) Their influence can maybe explain Alvar’s search for coolness in his wines, and for Toro this must be a much needed fresh air. Dark cherry red. Perfumed aroma; flowers, dark and red fruits (blackberry, cherry), a slight touch of coffee. It’s tasty and quite solid, yes, but it’s not coarse-heavy-rough like toro can be, and the acidity is good, natural. The most elegant red from this appellation I have tasted for years.